If you knew you were about to enter into a really hard challenge would you jump for joy knowing that your end will be great or would you choose not to enter at all? You don’t have to answer this at all. I am positive that you would be hesitant with a yes, because NO ONE would choose to go through anything rough. Everyone would choose the path of least resistance if they knew they could still get great results. Two weeks ago I decided to participate in a 5K walk with Agape Embassy in their support of Dee’s House of Hope. Mind you, I do not workout consistently. 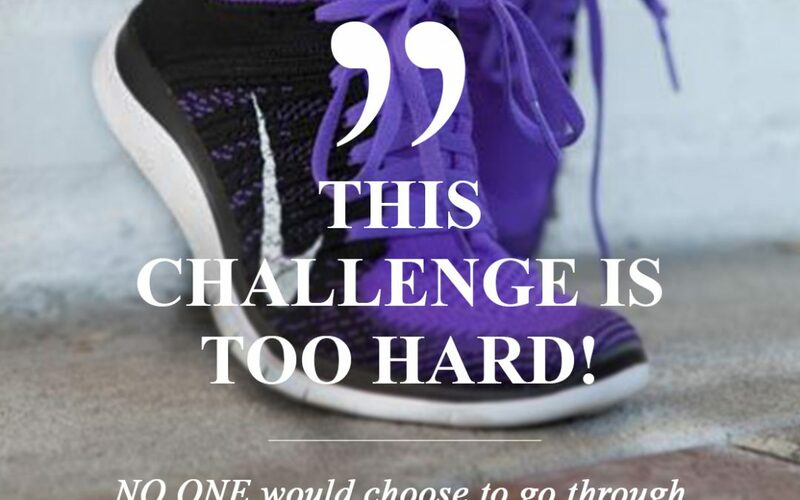 Counting the cost, I’m thinking 3.1 miles I can do without any stress, strain, or struggle so certainly I can do this. We have stretched, the ladies are excited and cheering, and we’re off. Maintaining a good pace, and a good sweat but I’m doing ok. I get only half way into the walk to find out that I am strolling down a hill and I am about to go up the steepest hill that I have ever tried to walk in my life. I promise you that I wanted to quit as soon as I saw that hill. My thighs and my chest muscles were already burning and I knew it was about to get worse. I felt like I had never walked before. LOL!! I wish I had driven that route before I walked it. Selah! Listen! Brace yourself because you are about to venture into some things that you are going to want to quit in but DON’T QUIT! I promise you that the end of the walk is closer than you realize. I am so glad that I didn’t know all of those hills were a part of the walk because I promise you that I would have bailed out of the walk way before I ever started. I thank God for the ladies that stayed right there with me and were encouraging me along the way. However, on my way back I had to go up the hill that I had strolled down and when I got to the top I looked to my left and saw where everyone was waiting and my thought was “cut through the grass and you can be finished.” Regardless of how I felt or thought I had some accountability people with me that I could not allow to see me quitting. You will not always have someone with you when you are going through a challenge but the Bible says in Proverbs 10:9 “Whoever walks in integrity walks securely…” and Proverbs 11:3 “The integrity of the upright guides them…” Always allow your integrity to guide you regardless of who is with you or not with you. My point I wanted to make is this; let’s change how we enter into a challenge. You don’t need to know every obstacle that will be set up for you. Let’s go in it knowing that it’s not forever, we will survive, and we will win. But go in! When I came across that finish line it was the most exhilarating, spurring, and intoxicating moment for me. I DID IT! Yes!!!! I love this so much! I CANT QUIT!! I will not quit, no matter what comes my way. YES Dr. Dee Dee you did again. Love your transparency. I so needed this. I have been in a difficult situation in my marriage for the past few years and I was feeling like maybe it’s time to quit. I will keep trusting God and pressing forward. I will NOT QUIT!!! I’m right there with you. I’ll keep you and your narrative lodged in prayer as I can certainly empathize. Be blessed and be encourage my sister in Christ. Trust and Apply principles that you know to do. Love! I’ve have surely had my challenges lately! I’m pressing..I also , reminding my self sometimes we have to pace ourselves. The race is long and not required to always be swift. I can’t accomplish all the things (goals, desires,requires) during each season. I’m in my planting seeds season in every area of my life… but The harvest with be plenty in God’s appointed time! I like how you said sometimes we have to pace ourselves. I guess iyvis not the challenge but, what you learn through it. I guess its not the challenge, but what you learn through it. Thank you for this! There is always a great reward if you continue the process! Thank you for the encouragement to not give up when things get rough!! I’ll admit I’m in one of the toughest race of my life and at times I want to give up. But I know this man name JESUS who causes me to triumph even when things don’t seem to be getting better. I know God is with me. Pray my strength!! I will complete this race! Love your blog! Thank you for your example! Love you! Thanks for the encouraging word, Dr. Dee Dee! Love you. This message was just for me. Thank you. I won’t quit. So true! Wonderful reminder! Thanks for the encouragement. Sooooo inspiring!!! Thank you, Dr Dee!! Such an encouragement. I love you incredibly. Integrity keeping you secure when no one else sees really resonated with me. Thank you for this beautiful seed! 🙋🏾 That’s it wright there INTEGRITY. This action of Integrity will come at a price but the value is so much greater,and give so much strength.We have to endore to the end. Any things worth it’s weight will have a some form of integrity. We see this all through life.And God is well able to help us to the end. Awesome! I will not quit. OMG! Thank you Dr. DeeDee. This word comes right on time as I embark my 1st half marathan(13.1K) this weekend. This word has truly blessed my spirit as I need this encouragement today. God knows this is a hugh challenge for me and I will not give up or quit! Thank you again as I am soooo glad Iam connected to you! I promise I just had a conversation about wanting to quit, pack up and move 3 days ago. this is so right on time. I am staying the course. Prayers make it possible; not easy just possible. Needed to hear this and I love it!!! CAN’T QUIT! I felt the same way when I started my Couch 2 5K Training for a run I am doing on October 1. During week 4, I was running for 3 mins…walk…run for 5 mins. 3 min run was no problem cuz I trained for that last week, but this 5 min run…..wheww and part of it was uphill. I wanted to quit. I soooo wanted to quit. Nobody would know. I was out running by myself. But guess what? I would know and I’m not a quitter. The pace wasn’t as fast as it had been but I was still running. The breathing was a lil more heavier but I was still running. The legs might have been tired but I was still running. The older mothers in the church would say, “Keep running to see what the end gon be like”. My end gon be to RUN this Vikings 5K on October 1 and celebrate with a pint of Ben and Jerry’s Non-Dairy PB&J Cookie ice cream…..YAZZZZZ! Awesome! I’ve resumes classes again this semester at University of Baltimore so I needed to hear, “Don’t Quit”! Thank you and congratulations on the walk! Thank you for the encouragement. My husband and I lived apart for the last three years for work reasons and we are now back under the same roof. As you can imagine there are some challenges as we adjust to living together again (even though next March we will be married for 30 years). I can now give thanks for these challenges and look forward to the outcome as we are more unified and free from strige that these minor challenges are capable of creating. Right on time. I needed this encouragement. I WILL NOT QUIT!!! Thank you Dr. Dee Dee. I really needed that. I will not quit. I thank God for your encouraging words. Praise God for your transparency Dr. Dee Dee! This blog today gave me life; as I’m facing some very difficult challenges with my adult children! Proverbs 10:9 whoever walks in integrity walks securely….As long as I carry them it will NEVER give birth to change. I know now that “NO TOLERANCE” means NO COMPROMISE! Thank you for being our end time John the Baptist! For the race is not given to the swift nor the strong, but the one that endures to the end. You did it, you crossed the “finish line”! So proud of you, Dr. DeeDee! Thank you DEE DEE for the encouragement it helps to hear that other women of God can relate to what you as an individual are dealing with and also to hold on, knowing that weeping may endure for a night but joy comes in the morning again thank you and may God continue to bless you! I felt like quitting plenty of times. Having Jesus as my rock and firm foundation I was continually filled with His strenght. Thank you for the encouragement Dr. DeeDee to remind us we are victorious and the Word can be trusted. My 10-year old daughter wrote me a letter that said I was her hero because I never gave up when times got hard. I cried immediately. I was proud to see she saw that in me. I also want to know what does she as ‘tough’. With the Word, today’s blog, and my daughters letter just the inspiration I need to keep going and ready to embrace the challenges for the week. I ABSOLUTELY LOVE THAT! everyone needs a cheerleader! it was encouraging to see you finish and your friend being so proud that you finished because she knew you could, she knew you had it in you all along. This was exciting to see and a great visual to have when we enter a challenge, the picture of you FINISHING WITH A SMILE! good job doc!!!! Thank you for the encouragement! Congratulations and blessings!! Enjoyed your post. No one wants to face tough challenges, but God is faithful. That is something I know for sure. Every day is challenging for me, but I try to function as an able-bodied woman, taking care of my household,my grandson, and myself.I have become even more determined to contend for my dreams of becoming published after having a stroke before my 50th birthday a few years ago. Wow I needed this message today! Thank you! Awesome we can’t quit wow have to finish every challenge that comes. My take away nugget: “it’s not forever, I will survive, I will win!!! Thanks Dr. Dee Dee! THIS was probably my favorite blog message to date! Oh my gosh, finishing a challenge like that and wanting to quit or cut through the grass is a REAL feeling/thought process! To have had people cheer u on through that entire process and NOT give I all the details was awesome! My husband loves bike riding but not some little leisure ride at .3 mikes an hour- this guy likes to ride from redondo beach to Santa Monica AND BACK! He would tell me we were riding to the “white” building and we’ll be done. Unbeknownst to me I didn’t realize that the white building was in freaking Santa Monica and that it looked closer than it actually was. But when we got back from that long bike ride I realized that I made it! HE KNEW I could do it if I didn’t know exactly how far I was going (along with promising to treat me to a restaurant that was located “over there”) and he knew that I would have immediately thrown in the towel if I actually knew how far we were biking!!! So I totally get it!! This was a great blog entry!! I really enjoyed the video too!! I am so glad you DO NOT have quit in you!! You cannot imagine the number of people’s lives that are impacted because you WILL NOT quit. You stayed focused on the promise (the finish line) not the process (the hills)! I LOVE IT! Now that you know about the hills…I will see you this same time next year!! This is so good! I really like the piece on integrity you shared. Thank you so much! This message is right on time! Thank you for always sharing your day-to-day experiences, which are so encouraging and uplifting. This is so awesome! I needed this word right now for the greatest challenge that I am now embarking upon. Like you, I chose it. It’s a good one but it’s a tall one. I can and will do all things through Christ Jesus which strengthens me. Thank u Dr. DeeDee. This was awesome! If it is hard I must do it!!! This is awesome and an on time word. If it is hard then I know that is what I must do. Love that video. Thank you Dr. DeeDee for keeping it real and really helping! I’ve just been infused. By the spirit of of God, you always know what I need. I am facing a situation currently my faith, however remains strong as I continue to walk in integrity. God is a rewarder of them that diligently seek him! Thank God for accountability partners! Thanks for this post… I had a major surgery on this past Monday, one that I feared and even postponed for about a year. There are many obstacles on this road to recovery but I’m so glad that I have a great support system (family and friends) who are helping me and cheering me along the way. Thank you for this encouraging words. I really needed this to help me continue my challenges I’m facing. This was right on time for me Dr. DeeDee. I’m in it to win it! I am not a quitter! Thank you for sharing this. Press in…. 🚫 Not Quitting!! Thank you Dr.DeeDee! This reminds me of my on challenge with my courses in school. I challenged myself to take 19 credits of all major courses, not knowing all those courses were tough courses. It’s the ending of the third week of classes and I started to feel like I wasn’t going to make it, because it was too much for me. Everyday I push myself more and more to get the work done and not procrastinate and I do just that. I Can’t Quit Now! I have to keep pushing, even when I don’t feel like it. I have people on the sideline rooting for me along the way and when I get to the finish line (graduation) everybody is cheering and waiting for me to make it across. Amen!! I am going to hang in there and not quit. Thank you Dr. Deedee for the encouraging words.